It’s been business as usual for Waupun (Wis.) 2019 small forward Marcus Domask. 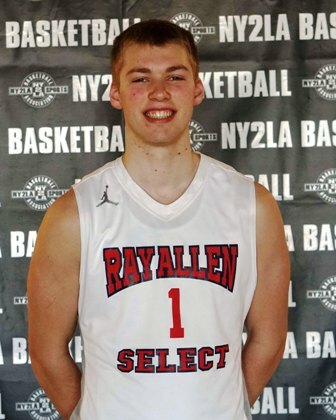 Fresh off averaging better than 20 points per game as a sophomore, Domask has one again been impressive during the NY2LA Association, staking his claim as one of the top prospects in the 16U Division. As usual, Wisconsin-Green Bay is ahead of the curve with in-state prospects and remains the lone school to offer Domask. Last season, Domask averaged 20.4 points, 7.4 rebounds, and 4.3 assists per game for Waupun, who posted a 19-6 record. As a freshman, Domask led the Warriors to a Division 3 state championship. Wisconsin has also been linked to Domask since last season. “They watched me play a couple of times and called my dad,” he said. Domask was one of just three sophomores selected to the All-State teams in 2016-17. The 6-foot-5, 205-pound wing also currently has Ray Allen Select at a perfect 8-0 record in the NY2LA Basketball Association. Domask plays for Ray Allen Select during the travel season.